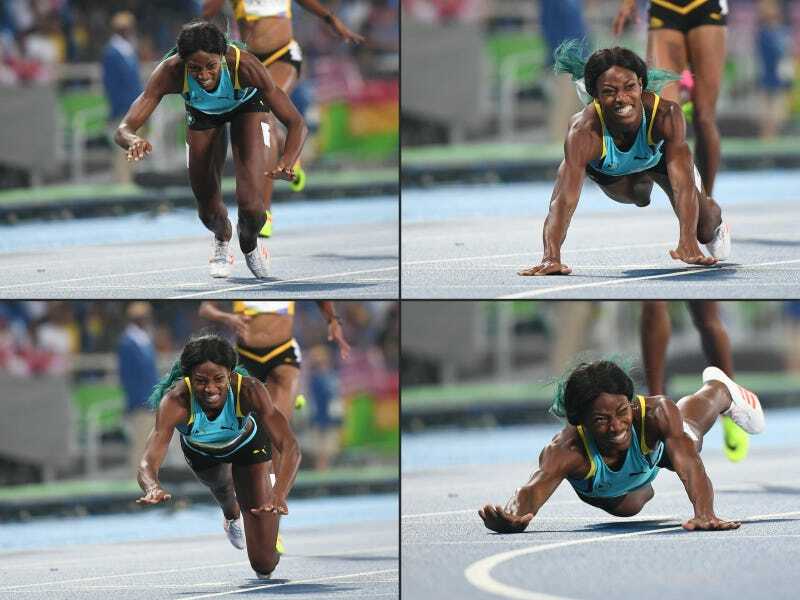 This combination of pictures created Aug. 15, 2016, shows Bahamas' Shaunae Miller diving to cross the finish line to win the women's 400-meter final during the Rio de Janeiro 2016 Olympic Games on Aug. 15, 2016. Shaunae Miller is the darling of the Bahamas when it comes to track and field. And during Monday night's women's 400-meter race at the Rio de Janeiro Olympics, she proved nothing would stop her from winning a gold medal. In the close race, Miller dove to the finish. Literally. And it pissed off a lot of people who didn't think diving was allowed in running. Miller ended up with the gold medal because of her dive, and U.S. runner Allyson Felix earned a silver medal because of Miller's theatrics. And for the record, the dive was totally legal.